Some came from Ho Chi Minh and some even flew in from Singapore. For those KAIST alumni who gathered in Hanoi, the trip was well worth it. 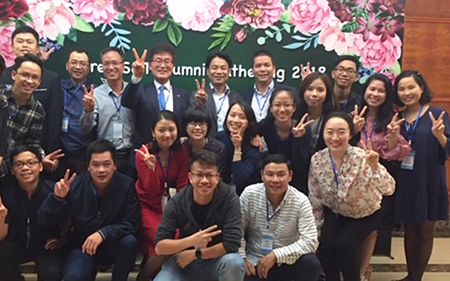 More than 100 Vietnamese alumni of KAIST, GIST, and UST attended the reunion in Hanoi on November 24. Presidents and vice president from three universities welcomed them and celebrated their successful careers after returning home or starting careers in other countries. The reunion was co-hosted by KAIST, UST, and GIST in an effort to make a platform for continued networking for scientists who have studied at Korea’s science and technology universities. This joint reunion will be expected to include other science and technology universities and institutes in the future. Among 1,873 international KAIST alumni from 106 countries, the number of Vietnamese graduates is the most dominant with 262 alumni, 14% of the total international alumni. Welcoming them, KAIST Vice President Soohyun Kim said that he was very impressed that all of the alumni are making a very impressive stride in their fields. “You will be a big asset to make your country grow. You will also be a bridge for future collaborations with your institutions and KAIST and Korea. Vietnam holds great potential for future prosperity especially in science and technology and we look forward to seeing this network continue to benefit both countries.” Vice President Kim said all of the presidents shared the idea to make this gathering a regular event. “Other S&T universities will join to hold joint reunions in other countries in the future,” he added. She cites a supporting culture, a competent educational system that places a focus on practicality, and rich resources that help researchers try whatever they want as the distinct advantages of a KAIST education. “I never heard my professor saying “No” to any of my suggestions in conducting research. Professors and lab members put all their efforts, resources, and facilities to getting my research started. They helped me obtain all the resources that I needed. It was a huge encouragement to me,” she added. 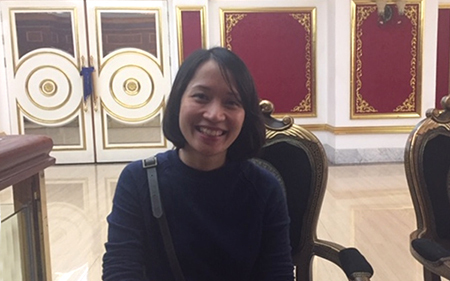 She started her Masters, along with four Vietnamese colleagues, right after graduating from the Hanoi University of Natural Sciences, a top science university in Vietnam. Their experience at KAIST during a 4-week exchange program during undergraduates made them decide their academic destination without any doubt. All of them finished their PhDs in 2013. Two of them moved back home and the two others are now in the US and Germany as postdoctoral fellows. However, like many PhD candidates who feel pressure about their studies and an uncertain future, her days at KAIST also included challenging times while adjusting to Korean culture. She took Korean classes for three semesters voluntarily at the KAIST Language Center to better understand Korea and her lab members. Her efforts paid off well. She could easily communicate with her colleagues and felt she became a real part of the inner group. But the stress remained to prove herself in research and she still had to deal with some bias. “I know some people think Vietnam is behind Korea. Many people think that we are not as good as Korean students because we are from Vietnam. I desperately wanted to prove that I am as good as my peers.” Studying together with Korean and other international PhD candidates, she realized that everyone has their own purposes and pressures. “Even though there are minor differences, every PhD candidate has the same issues with their uncertain futures. It was quite comforting when we shared that it’s not only my problem. To understand that it’s a problem we all share comforts us a lot and we came to support each other. To better help students release such pressure and stress, she said the university needs to create more diverse institutional channels to communicate with them. “Looking back, I was younger and less competent to speak up about when we were stressed and needed to ask for help. I hope students can begin to release their pressure and stress through diverse channels and resolve the problems,” she said.